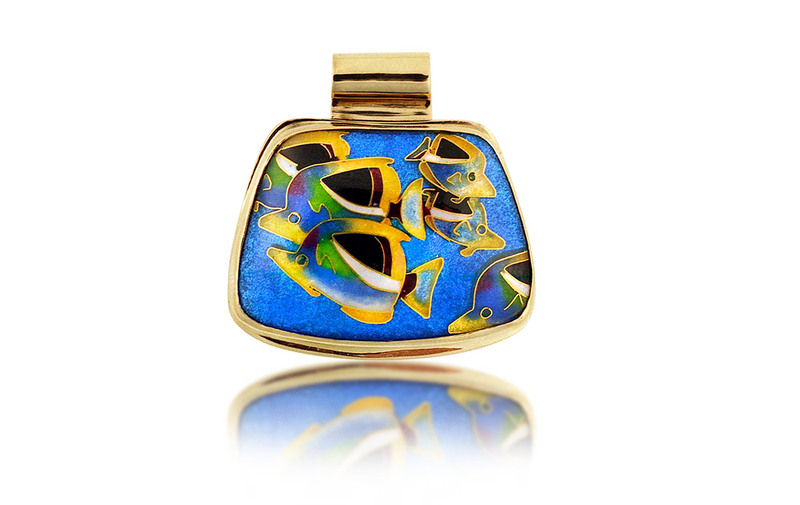 Butterfly Fish Pendant is a cloisonne jewelry piece created by Patsy Croft. It belongs to Ocean collection of amazing enamel jewelry with unique jewelry designs. Yes, yes the ocean and reef where I long to be. But when you can not be there what better to do than to wear your favorite cloisonné jewel piece of the ocean! In swimming the reef of Hawaii you can see many Butterfly Fish daily, and many varieties. The butterflyfish are a group of conspicuous tropical marine fish of the family Chaetodontidae; the bannerfish and coralfishare also included in this group. The approximately 129 species in 12 genera are found mostly on the reefs of the Atlantic, Indian, and Pacific Oceans. A number of species pairs occur in the Indian and Pacific Oceans, members of the huge genus Chaetodon. Butterflyfish look like smaller versions of angelfish (Pomacanthidae), but unlike these, lack preopercle spines at the gill covers. Some members of the genus Heniochus resemble the Moorish idol (Zanclus cornutus) of the monotypic Zanclidae. Among the paraphyletic Perciformes, the former are probably not too distantly related to butterflyfish, whereas the Zanclidae seem far less close. Enjoy and get in the ocean!